Toshiba’s Digital Products Division (DPD), a division of Toshiba America Information Systems, Inc., today announced the 14-inch USB-powered Mobile LCD Monitor, ideal for adding an additional screen to any Windows-based laptop computer at work, school, home or anywhere one uses a laptop. Featuring a 14-inch diagonal widescreen display1 with 1366×768 resolution, the Toshiba Mobile Monitor is equipped with the same LCD panel as a laptop to provide clear and crisp images. Weighing only 2.8 pounds and less than one inch thick, this ultra-portable monitor is designed to easily fit in most laptop bags. The monitor’s power and video are both through a single USB connection, eliminating the need to carry an AC adapter or video cable. 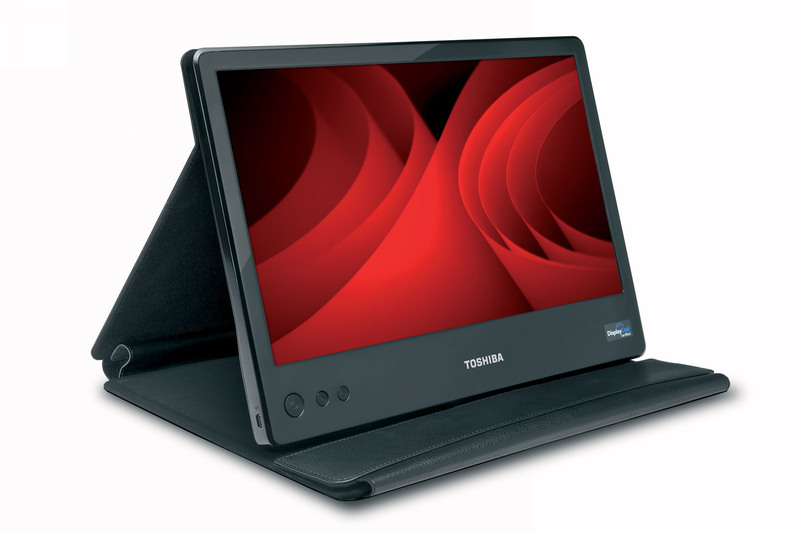 Via video over USB technology from DisplayLink™, the Toshiba Mobile Monitor can also be used as an additional screen in extended mode for serious work, home and on-the-go multitasking. As an added bonus, the Mobile Monitor includes a protective black vinyl carrying case, which quickly folds into an adjustable stand that can be set to various viewing levels and also deftly houses the monitor’s USB cable.